Good morning! Ardyth here with a fun technique for making a faux-enamel embellishment for your card, to add shine and interest! I started by using the Stitched Hearts dies to cut 2 of the second smallest hearts from the cardboard backing of a paper pad. I glued them together so they would become one thicker piece. I laid the heart down and poured 3 different colours of embossing powder over the top. No ink, just powder. Then I placed a small piece of parchment paper over the top and started melting the powder with my heat gun. Once it was melted, I tapped the paper a couple of times to get it to move a bit and be sure that the whole surface was coated. To remove the paper, you need to keep the heat gun going so that the powder doesn't start to cool and stick to the parchment. I carefully peeled back the paper to reveal a marbled, shimmery 'enamel' heart! 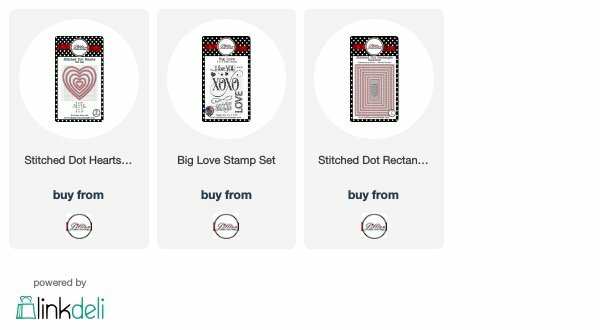 I cut a panel of white cardstock with the Stitched Rectangle dies and then stamped the XOXO from Big Love, with the right-hand swirl going right off the edge. I embossed it with sparkly embossing powder for even more interest, and simply backed the white panel onto a larger black rectangle and then the whole thing onto a white card base. I am so excited to try this - thank you so much for sharing!! !